The Yale narrow aisle truck MTC 10 was especially designed for applications where a maximum utilisation of storage space is important in the warehouse. The truck at Ellerhold has a lifting height up to 7,800mm with a capacity of one tonne. Through the use of a pantograph the width of the vehicle has been reduced to 1,420mm. 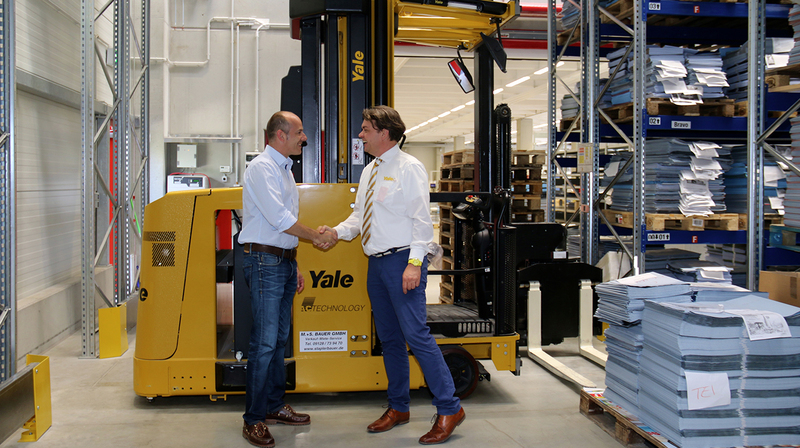 In addition to the new MTC 10 narrow aisle truck, Ellerhold owns a Yale GLP 20 SVX forklift, an MP16 rider pallet truck and a Yale MSC10 pedestrian stacker. Founded in 1987 in the town of Zirndorf, near Nuremberg, Ellerhold Group has developed in a short space of time into a well-known poster printing company, with a staff of 600 employees in Germany and a total turnover of around EUR 76 million in 2015. This entry was posted in Case Studies, Compact Internal Combustion Trucks, Dealers, Electric, Internal Combustion Trucks, Pallet Trucks, Pedestrian Stacker, Very Narrow Aisle Trucks, Warehousing and Distribution and tagged Counterbalance, Dealers, Dependability, Electric, Energy Efficiency, Germany, Manoeuvrability, Materials Handling, People, Productivity, Products, Storage Rooms, VNA, Yale, Yale Europe Materials Handling. Bookmark the permalink.